Olive Skin Serum is the ultimate anti-ageing, hydrating and brightening serum that is clinically proven to treat wrinkles and dehydration. 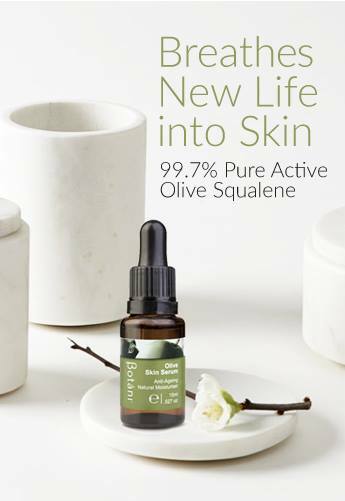 The plant active, Olive Squalene replicates the Squalene that is naturally produced in human skin. As the formula is bio compatible it is well-tolerated by our skin and is deeply hydrating. It is also non-greasy; spreads easily & penetrates quickly into skin. Anti-irritating and gentle enough for all skin types/conditions especially sensitive, damaged, eczema, mature, ageing & dehydrated skin types. Available in 15mL. Olive Skin Serum contains 100% phyto-active Olive Squalene which resembles the built-in moisturiser each of us has in our skin. This in-built moisturiser and skin protector, “Squalene”, decreases as we age making our skin vulnerable to free radical damage and premature ageing. It’s therefore vital to replenish your Squalene levels daily! Sourced from the humble olive, this skin-friendly, anti-aging treatment imparts a non-greasy satin finish, that is ideal to use under make-up and suitable for all skin types and conditions. Clinically proven to increase and seal moisture levels in the skin within 24 Hours, learn why Olive Squalene is as vital to the skin as water is to life here. As we get older, the built-in moisturiser and skin protector that each of us has in our skin (known as squalene) decreases, leaving our skin far more susceptible to damage and aging. By replenishing our squalene levels on a daily basis, we can help to prevent and reverse these effects and reclaim the healthy, youthful glow that we desire for our skin. 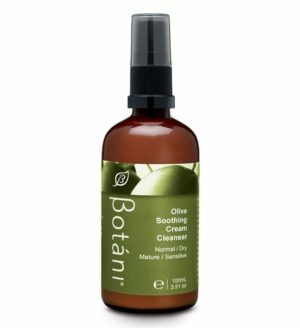 The Botani olive skin serum is specially made with high levels of squalene in order to maximise the healing and anti-aging qualities of the product and to help improve the overall health and glow of your skin. Carefully and thoroughly tested, our simple formula is clinically proven to increase and seal moisture levels in the skin within 24 hours; and, because we don’t use any toxins in our products, you can be sure that our olive skin serum is suitable for your skin regardless of how delicate it may be. The olive skin serum Botani has created is designed around our policy of using all natural ingredients that work with and nourish your skin, rather than using manufactured chemicals that can serve to irritate skin and cover up problems rather than truly overcome them. We source our organic Mediterranean olives directly from their heartland in Greece. Once the olive oil has been extracted from the olive, the squalene is extracted from the remaining pulp of the fresh pomace of the olive. This ingredient is then used to create our olive squalene rich, olive skin serum, which we produce right here in Australia and package with clearly labelled, environmentally friendly materials and straightforward instructions. 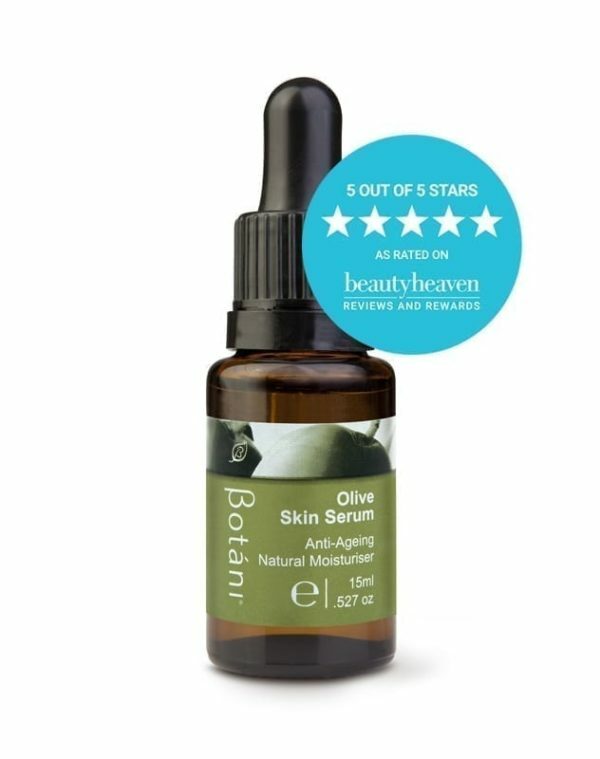 Like the rest of our product range, the olive skin serum Botani produces is certified by P.E.T.A. as 100% vegan and cruelty free, so you can rest assured that no animal products were used to create it, and no animals were involved in the testing process. And just as we put animals before profit, we also put people before profit. The entire process of producing the Botani olive skin serum, from sourcing our ingredients and manufacturing the product, to the distribution and marketing strategies, are designed to ensure that everybody gets a fair deal. By respecting animals, trading fairly and making a conscious effort to minimise our impact on the environment, here at Botani we’re proud to give back to the community every time we create our olive skin serum. 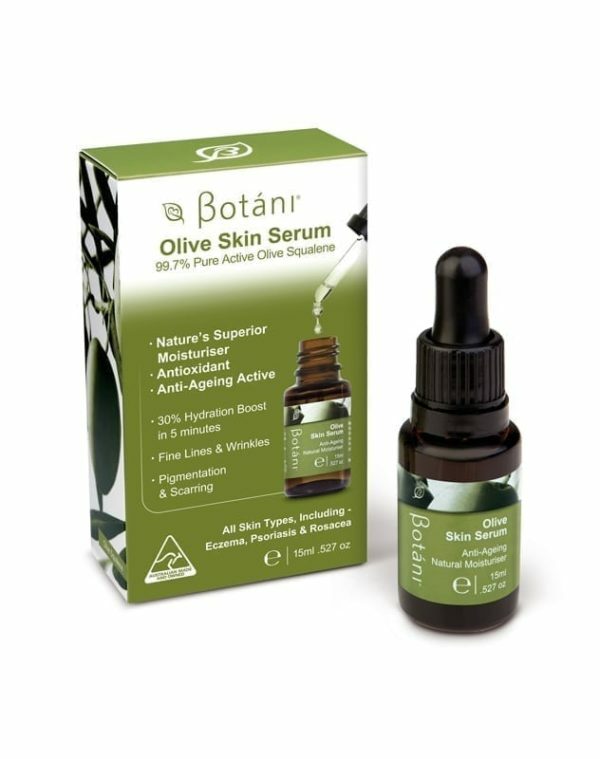 If you’re looking for a simple, humble and natural olive skin serum that will immediately restore hydration and luminosity to your skin with no risk of irritation, place your order online today or contact a member of the friendly Botani team for more information. 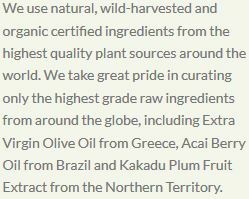 Botani supply organic skin care products throughout Australia. We also have available a great range of certified organic skin care products. Some of our products include skin serums, natural acne treatment & the best facial cleanser in Australia. 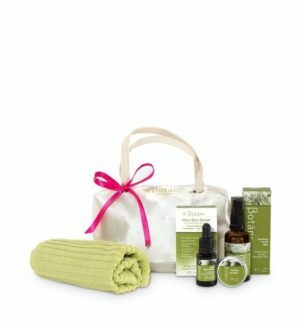 Dampen skin with water or Soothing Facial Mist. Immediately apply in a pressing motion 3 – 4 drops all over face. Can be used interchangeably with Acai Berry Active Antioxidant Serum. I really love this product. Even my husband, who has very sensitive skin uses it twice a week. It makes visible difference and we both enjoying its elegant and delicate smell. I use this daily and it has really helped keep my skin hydrated and has not given me any blemishes, which is great as I am prone to blemishes. Such a great serum i am using it everyday now. Only need 2 drops after toner and you can feel that your skin is more supple, reduce the size of the pores and the glow on your skin will come back. Skin feels immediately more hydrated. Amazing product, has so many purposes! Of particular importance to menopausal skin. Put a few drops into a spritz…use under and over makeup. Very hydrating for all skin types-especially hormonal skin. This serum is absolutely amazing! At first I was worried about putting oil on my face, but it is actually light weight and absorb really quickly with massage. Face feel really soft overnight and very moisturising. Highly recommended!! Best serum I’ve ever used hands down! I’ve spent years trying to find skin products that my sensitive/combination skin would love and after finding this serum a few years ago I haven’t looked back! Rose hip oil would always make me break out and others were too greasy but this soaks right in and i remember noticing the difference immediately. I use it morning and nigh, can’t live without it. Ahhmazing! This serum is amazing, it keeps my skin so hydrated! I have extremely dry and sensitive skin that is prone to eczema and this product is my life saver. I totally can’t live without this serum. I have used up 10 bottles already and I will keep using it as my daily skin supplement. 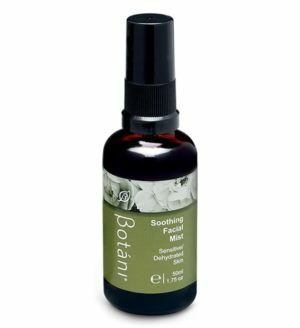 Botani’s squalene is doing true hydration on my skin and it is easily absorbed. I recommended it to many of my friends, some of them believed the magic of squalene while some don’t just because they don’t know the mechanism behind the work of squalene. anyways, good invention. love it! I truly love this product! Honestly, the best thing I’ve used in years! Excellent. I would give a 100% rating for this product. The serum not only hydrated and nourished my skin but also helped in removing tan. Amazing product – love it. I have been using this Olive Skin Serum for a few weeks now and am happy to give it a big thumbs up! Firstly, the dropper bottle is fabulous – it’s easy to use and lets me measure out exactly how much I need with no wastage. Secondly, I love how light it is, and how quickly and deeply it absorbs into my skin. The first time I used this product, I immediately noticed the instant hydration effect it had and how it left my skin feeling velvety smooth. It has certainly improved my skin tone, giving me a natural glow and the super hydration has returned the freshness and suppleness that has somewhat diminished with age. 100% natural, a subtle scent and its feather-light application make this liquid gold moisturising serum a winner in my books for smooth, silky and radiant skin! Absolutely loved this product! Really is a miracle serum – it worked wonders in keeping my skin from drying out in patches due to the cold weather, worked well on existing stretch marks and scars. My mum has also been using this on her wrinkles and she has noticed a reduction in them! It really is amazing! Thanks Team Botani for your wonderful/miracle product! Oh mygoodness! Everyone has to use this product! My skin has felt hydrated since the morning after I started using it! The little dehydration lines i had are now gone. My skin is literally glowing. And i was shocked at how non greasy it is!! No need to sit there waiting for it to soak in like i used to have to do with rosehip oil! I really love this product and would recommend it to others. It adequately moisturises and hydrates my skin without leaving it feeling greasy or oily. My husband and son also have dry skin and it helps with rehydrating their skin too. I was so very happy when I got the results as predicted by the product. Some of my fine line have dissipated. The small splodge of eczema that was on my face disappeared completely, hopefully never to be seen again… What made me the happiest is how soft my skin feels now, without feeling oily. I followed the instruction on the packet and wash my face but left in a bit damp and the serum just soaked right in. Although I have been being sneaky at night and mix 2 drops in with my moisturiser to make it go further. Also used on my sister hand when she had very bad seasonal eczema, and it gave her much relief. i could go on and list all the benefits Olive Skin Serum delivers… But instead i’ll say; Olive Skin Serum is Liquid Love for your Skin! This is what i use as my night cream. As i find that for me it works really well. I think that since i have been using this I can see the results. I have noticed less wrinkles and the fine lines have certainly lessened, which make me a happy Botani’ user. Who is very happy with the results I get for your amazing products. Have been using the serum together with the Botani cleanser and before the Botani moisturizer and absolutely loving the results. Just a few drops are enough to cover the entire face. Apply it when still damp from cleansing and you can feel the difference immediately. My whole face felt so much softer and more radiant. As its non greasy its perfect for acne prone skin and works beautifully under makeup. Love the glass bottle with the dropper which helps you dispense just the right amount. Does not flare up any existing acne and helps smooth fine lines and acne scars. Its very gentle and suitable for sensitive skin types as well. I love this serum, I have combination skin and this doesn’t feel greasy at all. It absorbs effortlessly into the skin and leaves it feeling hydrated, smooth and even softened my fine lines! This is the only product that is gentle enough to use on an unsightly keloid scar that I have on my chest wall. This oil hasn’t irritated the scar, and has softened it, and helped to decrease it’s appearance. It’s wonderful, and thanks to Botani, I’m no longer so embarrassed by the scar. An Amazing product to reduce fine lines and glowing the skin. Highly recommended to whose people suffering form dryness, sensitivity, dehydration, and problematic skin like enlarged skin pores! I love it! I LOVE this product! It smells great, isn’t oily to apply and leaves my skin feeling really soft. I have quite dry skin overall but an oily T-Zone and i find this product is moisturising to both skin types. Highly recommend! I love the Olive Skin Serum! It has been part of my nightly beauty routine for over a year and it has kept my skin hydrated and happy! I’ve used Rose Hip Oil in the past but much prefer the olive serum as it doesn’t take my skin as long to absorb. And also as its clear in colour it doesn’t stain my pillow case like the Rose Hip Oil did! Would highly recommend Botani! This product has becmoe a staple in my skin care regimen! It leaves my skin feeling very soft and smooth and the results were noticeable after only a few days. I tried Regenerist as well, and honestly, it’s a waste of money. This product is gentle enough for around the eyes and does a much better job. I had problems for years with white bumps around my eyes before I started using this product, and they have all cleared up and not returned. It’s a tad bit sticky at first, but not bad enough to re-wash my face, and I’m very particular about anything greasy or sticky on my skin. Well worth a try. Great price, great product. A real winner!